Murphy beds not only create space-saving comfort in any room but they are very popular where floor space is limited, such as in small homes, apartments, hotels, and even college dormitories. In recent years the design options on Murphy beds have come a long way and offer custom features like lighting, storage, cabinets, and even office desk components. Murphy beds are versatile and can bring many benefits to the home. Here are a few reasons why the Murphy bed makes a great addition to any space. 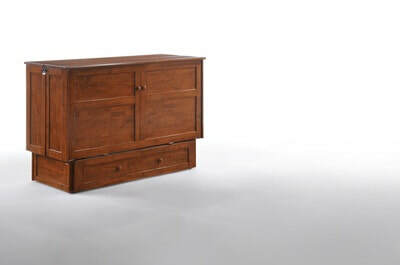 Cabinet Murphy beds are designed to add a touch of beauty and functionality to any room. As a more discreet object, these beds fold up into a classic looking wood cabinet that can be the centerpiece of any convertible bedroom. The story behind the invention of this type of bed is a pretty interesting one. 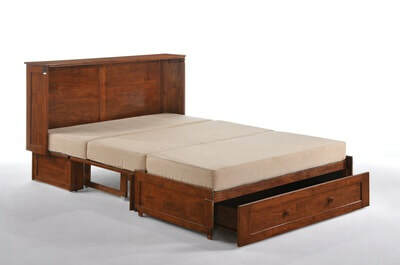 The bed is named for William Lawrence Murphy (1876–1957), who applied for his first patents around 1900. According to legend, he was wooing an opera singer, but living in a one-room apartment in San Francisco, and the moral code of the time frowned upon a woman entering a man's bedroom. Murphy's invention converted his bedroom into a parlor, enabling him to entertain. The Murphy bed helps create extra floor space and opens up the room when installed in place of a traditional bed. Since Murphy beds fold away when they’re not needed, they don’t take up any space on the floor, making the space available for other uses. Whether you live in a small studio apartment and your bedroom doubles as your living room or you have young kids who enjoy extra floor space for playing, a Murphy bed is great a great option. Another great thing about Murphy beds is that they’re easy to operate. 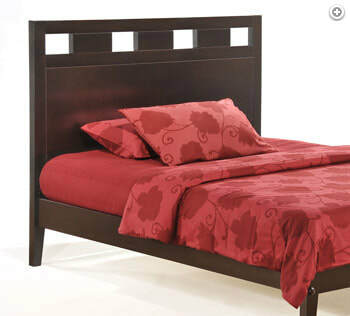 The counterbalanced design allows for easy folding of the bed that can usually be done with just one hand. Unlike futons, sofa beds, and other alternatives, Murphy beds are operated using a simple and safe maneuver and can be folded up and down with ease. You can also store them with the sheets and bedding on the mattress, allowing for even more convenience and quick access. Creating a multipurpose room in your home is another wonderful benefit of having a Murphy bed. This is especially true of smaller homes where space is limited. Some common combinations include the home office and guest room arrangement. Many Murphy beds can include a built-in desk on one end with the folding bed on the other. That way you can have a home office for your day-to-day use while also having a comfortable guest room when friends or relatives come to visit. Another versatile setup is the child’s bedroom and playroom combo. If you don’t have an extra room to devote entirely to your children’s toys and play time, adding a Murphy bed to their bedroom can double it as a playroom. Stop by and talk with our Staff at Renditions Furniture and take a look at our Murphy beds. We have Murphy Cabinet Beds to fit any style or taste. Come see us at our Boise location, conveniently located near the Boise Towne Square Mall. We would love to have you visit soon! Like many major purchases in the home, a mattress isn’t meant to last forever. The ideal length of time that your mattress is good for is eight years. Do you know how old your mattress is? If you have a sore back, then it might be time to replace that old, saggy mattress. If you’re ready to replace your mattress, then consider these helpful buying tips to make sure that your next night of sleep is a great one. As with all things in life, your mattress purchase will require you to set a budget. If you haven’t bought a mattress in eight years, then you might be shocked at how much they cost. At Renditions Furniture we make sure you get the best mattress for the budget you have set. While some consumers have ventured online to get a deal on a mattress, we highly recommend purchasing a mattress in a store so that you can be sure to try a variety out that fit within your budget. Memory Foam? Sleep Number? Firm? Plus? There is a lot going on in the world of mattresses these days. It won’t take you long to become a mattress expert. Here’s an easy tip: Memory foam or Tempur-Pedic is a mattress that will mold to the shape of your body. It’s as close as you can get to sleeping on a waterbed without actually sleeping on a waterbed. A sleep number bed lets you make adjustments in the firmness by using inflatable air pressure chambers. These are the beds that let you recline up and could even have separate settings for the person you’re sharing that bed with. Now that you’ve set your budget, and have done your homework, you should be armed with some good information. Now it’s time to head out to the stores and take a few mattresses for a test drive. Try the most expensive mattress in the store first. This is usually the high end of sleep luxury. You might spend five minutes on this mattress and want to blow your entire budget. However, use this to set the bar. Start working your way down the mattress ladder until you land on the perfect pick for your comfort AND your budget. It’s out there! The experts at Renditions Furniture will help you find it. As you try out the mattresses, consider what you’ll wear to bed. It won’t be bulky sweaters and jackets. This doesn’t mean you can wear your pajamas to the mattress store (though we are sure some have tried). However, you want to try out the mattress with the least amount of layers between you and that potential comfort. Now that you are prepared to pick out the perfect mattress this Spring, come in and see us at Renditions Furniture. Our Spring mattress sale is going on right now and we are offering free delivery on purchases over $499. We hope to see you soon and look forward to helping you find the best sleep comfort you are looking for in a new mattress. Randy opened America the Beautiful Dreamer in Boise, Idaho November 1989.